Disclaimer: The information given in this FAQ's page is generic. You should verify critical information such as visa-related issues, health and safety, customs and transportation with the relevant authorities prior to traveling. Please be aware that information given in FAQ's may change at any time. In effect, we accept no responsibility for any loss, injury or inconvenience sustained by anyone resulting from this information. For the latest updates, please contact us or our in-country coordinator(s). The founder of RCDP has been involved in volunteer abroad business for the last 10 years. During this time, he has worked with more than 2000 volunteers and more than 200 universities, colleges, and schools groups. Working with inspiring college students and humanitarian volunteers was very motivating as well as very enjoyable and presented many exciting learning opportunities. This experience encouraged him to start his own volunteer abroad program where affordable prices, premium programs and meaningful contributions to deprived communities would become the key components of the programs. With this in mind, while setting up volunteer and travel abroad organization, we have selected many safe and culturally rich destinations where volunteers can make meaningful contributions, immerse in local culture, and get enriched from volunteer abroad experience. In each destination, we have carefully selected projects, host families, travel coordinating staff, and placed local support staff. We have provided them with extensive training to manage the program with professional services that will be delivered with care and respect for all volunteers. We are now proud of our coordinators, host families, host projects, and staff as all of them have at least 4 years of working experience with international volunteers. 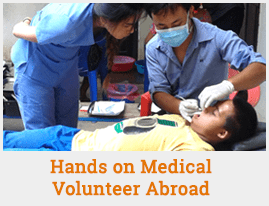 To meet your expectation, they are committed to working hard, delivering professional services, and turning your volunteer abroad experience into a memorable journey. Our volunteer projects in Mexico are located in such exciting places like Barra de Navidad, Melaque and Manzanillo. Our Volunteer in Mexico programs offer unique opportunities to serve humanity or help in conservation effort while simultaneously exploring the Mexican way of life and the landscape. Download the application form. Then, fill it out, and mail to RCDP. Once RCDP receives your application, it will immediately be forwarded to Mexico for processing. Our Mexico In-Country coordinator will then carefully review your application to ensure you get placed in the project that matches your criteria and your qualifications. Once the Mexico In-Country coordinator finalizes and forwards us the detail, we will immediately send it to you. The whole process normally takes 1-2 weeks. However, this can sometimes take longer. You will also find an invoice requesting you to pay the program fee along with the placement details. Once you receive the placement details, you can even call our Mexico office directly and speak to our In-Country coordinator and any questions that might you prepare for their trip. Preparation for Mexico trip includes: reading about Mexico, vaccination, visa arrangement, booking tickets. If you experience ANY problems, please call RCDP office. Once you purchase air tickets, they should immediately submit the flight details to BOTH RCDP and Mexico office. Volunteers are requested to arrive at Manzanillo Playa de Oro International Airport (ZLO), Manzanillo, Mexico. One of our representatives will be waiting for you in the arrival lounge holding a placard with your name on it. This will happen without fail when you pass your travel itinerary to our office. If you want to be absolutely sure, you can call your Mexico office and talk to our In-Country coordinator. There are two other airports in Puerto Vallarta and Guadalajara that volunteers can fly into. There won’t be any pickup from these airport but volunteers can hire a taxi to arrive at our office at Barra de Navidad. It takes about 4 hours from Puerto Vallarta and 5 hours from Guadalajara to travel to Melaque. If your flight gets delayed or if you miss your flight and book yourself on a later flight, please let us know immediately by either calling our office. You must try to call first and then email the details if possible. Look at your placement details for all the contact information. If you cannot make any contact and no one receives you at the airport, look at your placement details, hire a taxi and go to the hotels recommended on it. In the airport in Quito take a pre-paid taxi. Let the In-Country coordinator know your whereabouts after your arrive at the hotel or the next day. The coordinator will arrange for you to be picked up. Volunteers coming to Mexico are suggested to arrive one day before the start of program. If volunteers arrive more than one day earlier or remain after the close of their program, they will be responsible for their own for providing their own accommodation and meal. In Mexico, RCDP will provide volunteers with an accommodation and 3 local meals from the beginning to the end of your program. During the program, you will stay with a warm and welcoming host family. Volunteers in turtle conservation project will stay in a tented camp located on a beach. Our host families have all been carefully screened and chosen and will provide volunteers with a safe and secure place to stay. Staying with a host family will also give you a wonderful opportunity to immerse in local culture and practice your Spanish. The host families are based in the towns of Barra de Navidad and Melanque for teaching and special children project, and Manzanillo for the orphanage projects. All these towns are about 15-20 apart from each other. Our volunteers will also enjoy 3 local meals (breakfast, lunch and dinner) during the project. Breakfast in Mexico mostly consists of beans and tortillas with eggs and salsa. For lunch and dinner, chicken is very popular, or beef chopped for tacos with onion, cilantro and salsa is another option. These can be served with rice and salad also. Chorizo, which is like a sausage, and tamales are also popular with Mexicans. During the project, our country coordinator will always be available if you need any advice or anything. You will have the coordinator's cell phone number. Our project staffs and host families will also help and guide you to make your time in the project fun and enriching. RCDP advises volunteers to travel to Mexico with a tourist visa to avoid all the hassle in the airport. For details on visa, please contact your nearest Mexican embassy or consulate, or please contact us. The following vaccines may be recommended for your travel to Mexico. Discuss your travel plans and personal health with a health-care provider to determine which vaccines you will need. The currency of Mexico is Peso. ATM machines are available at various regions throughout Mexico where the option to take out Peso is available. Do not arrive in Mexico without any cash as ATM machines aren’t reliable and may fail to accept your card. Check with your bank to confirm that your card will work overseas. Debit cards and credit cards are acceptable at major stores. Travelers' checks are exchanged at the banks. In most locations, you won’t be able to exchange them. Debit card is the best way of getting money out and ATM vendors are available in most urban areas Visa, MasterCard and American Express are accepted in large stores and hotels in larger cities. Credit card fraud is a big problem in Mexico. Do not use cards at any smaller or non-reputable locations. You can get by with $30 a day provided you are careful in taking your money out. Accommodation and meal during your project is free but if you want to explore Mexico and shop, budget accordingly. We keep in touch with our volunteers. Our staffs visit volunteers every 2 weeks. You are encouraged to contact us if you want to speak with us on anything. You can also visit us. You will be provided with all the contact information. If you work in projects that are far from our In-Coordinator's location in Melaque you will be contacted by email, phone and fax. Internet cafes are around in most towns in Mexico. You can also use international phone cards to call home. You will be provided with full contact details of our office in Mexico. You are encouraged to call us should you want to do so. In addition, our program staff will visit you regularly to check upon you. Weather in Mexico varies because of the diverse landscape. To get update information of the weather, please visit the links below. It will be a nice gesture if you bring items like books, pencils, color pens, toys and games, especially if you are volunteering in schools and orphanages. You can also bring things like chocolates, CD, T-Shirts to the host family. The mission of RCDP is to encourage international volunteers to contribute in sustainable community development that benefits the underprivileged and extremely poor.